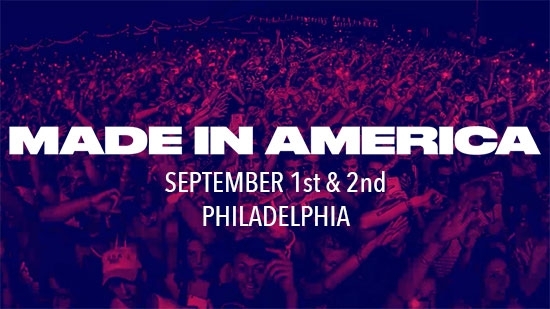 The seventh annual Made in America Festival returns to the Benjamin Franklin Parkway in Philadelphia this Labor Day weekend Saturday and Sunday, September 1st and 2nd. This year features Kendrick Lamar, Nicki Minaj, Post Malone, Temple U's Diplo, and Philly's own Meek Mill as headliners. The lineup also includes Zedd, Miguel, Janelle Monae, Alessia Cara, Fat Joe, and more. Other Philadelphia artists represented in the lineup include Armani White, Louis Futon, Mir Fontane, Orion Sun, and Zahsosaa. Be sure to check out them out as most play early in the day on the Skate Stage. The festival just released a detailed schedule of performances including times and stages so you can plan your weekend now. See the full schedule below. 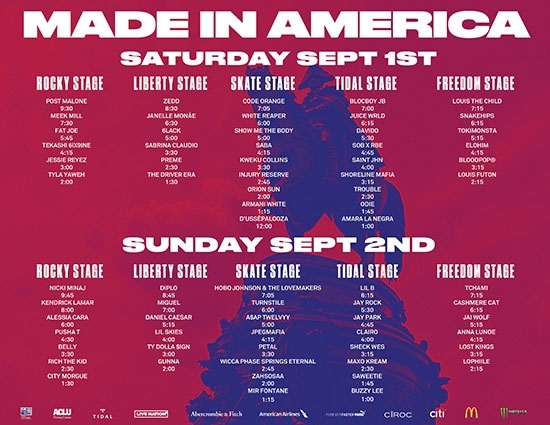 Detailed schedule for 2018 Made in American Festival Philadelphia.